Project obstacles and solutions: The Highway Department for Madison County, Indiana needed to repair and pave 100 miles of roadways during the summer of 2014. Their equipment had been phased out in 2013 and the roads had only been spot repaired during the past two seasons. They purchased new paving equipment in 2014. With so many county roads in need of repair, they needed to be able to work efficiently to be able to complete all of their tasks in one season. IMI Aggregates worked closely with the Madison County Highway Engineer and the foreman for the road construction. 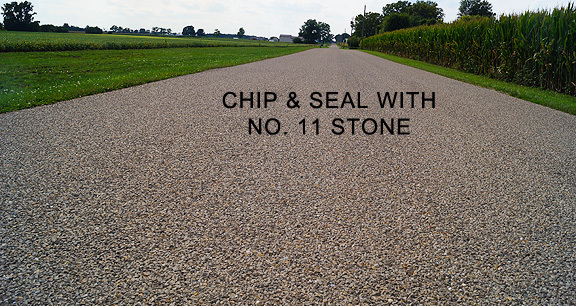 IMI QC/QA suggested they use a #11 stone, or in some cases, a #11 gravel to create a chip and seal pavement. Chip and seal is commonly used in road maintenance paving. The coarse aggregates are compacted on top of a layer of asphalt binder with a roller. It is used to repair and resurface roads quickly. The aggregates had to be clean in order to use the least amount of binder in the roads. Dust and small particles use up more binder than needed. The IMI Anderson and Pendleton quarries supplied washed and sorted aggregates to meet this challenge. In all, IMI supplied the highway department with nearly 14,000 tons of stone and gravel for the project.